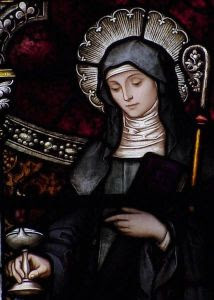 The Second of February belongs to Brigid, (Brighid, Brigit, Bride,) the Celtic goddess who in later times became revered as a Christian saint. Originally, her festival on February 1 was known as Imbolc or Oimelc, two names which refer to the lactation of the ewes, the flow of milk that heralds the return of the life-giving forces of spring. Later, the Catholic Church replaced this festival with Candlemas Day, which is dedicated to the Virgin Mary and features candlelight processions. The powerful figure of Brigid the Light-Bringer overlights both pagan and Christian celebrations. In secular culture this time of year became known as Groundhog Day—which was a big deal growing up in New Hampshire where the winters were fierce and we kids yearned for the sun to return so we could play outside again. Growing up, I did not know this yearly visitation of the groundhog had its roots in the ancient ways of our ancestors. Imbolc is a festival of the hearth and home and a celebration of the lengthening days and the early signs of spring. It was a time to start preparing the fields for the first planting and to bless the crop seeds saved and stored from the last harvest. This is the time for purification and renewal. Today, we can begin to till our actual gardens and we can also symbolically till the soil of our souls by letting go of something (or some action) that no longer serves us and plant a seed of intention to bring into our lives what we most want to harvest this year. Like our ancestors, I joined with several of my women friends in circle this weekend to honor this turn of the wheel and to set intentions for what we would like to see blossom in our own lives. It was a sacred ceremony that was blessed by fire and water, the two elements most associated with Brigid. For me, these are symbolic of the feminine aspect of the life-giving water and the masculine energy of the fire—like the sun—that when joined together in union give birth to new life. Growth and opportunity are abundant in this landscape. During the winter season, we rest in the darkness of the womb and the sun will now purify and bring energy and light to a new vision for ourselves and our world. What are you longing for? What would you like to see bloom more fully in your life, your work, your relationships? Plant the seeds of intention now, nurture the ground, and harvest the gifts as we journey through the cycles of the seasons in the coming year. within the cycles of the moon. each by all the others held. joining each to all again. into the darker circles of return.